Australia, officially the Commonwealth of Australia, is a country in the southern hemisphere comprising of the mainland which is the world's smallest continent, the major island of Tasmania, and numerous other islands in the Indian and Pacific Oceans.N4 Neighbouring countries include Indonesia, East Timor and Papua New Guinea to the north, the Solomon Islands, Vanuatu and New Caledonia to the north-east and New Zealand to the south-east. On 1 January 1901, the six colonies became a federation, and the Commonwealth of Australia was formed. Since Federation, Australia has maintained a stable liberal democratic political system and remains a Commonwealth realm. 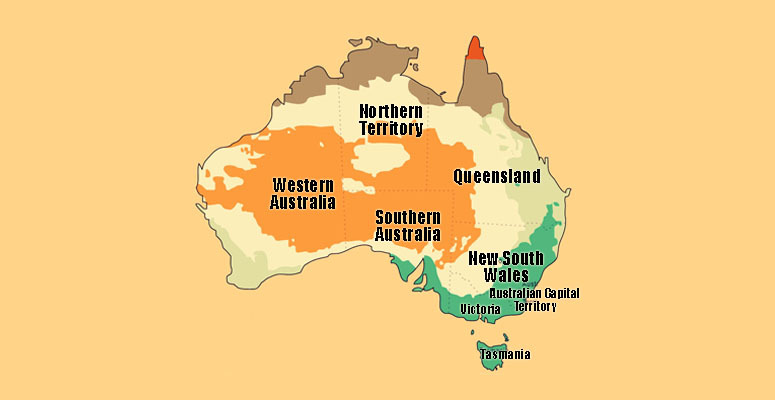 The population is just over 21.7 million, with approximately 60% concentrated in and around the mainland state capitals of Sydney, Melbourne, Brisbane, Perth, Adelaide, and Darwin. The nation's capital city is Canberra, located in the Australian Capital Territory (ACT).